Sunshine Motors - Buy Here Lease Here Car Dealer in York PA! 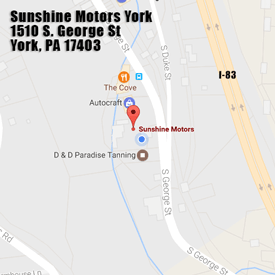 Sunshine Motors of Central PA is THE TOP RATED Buy Here Lease Here used car dealer in York PA! Our mission is to help customers with bad credit or no credit get the car they want or need. No credit checks, no car loans, and no lenders. A warranty on the motor and transmission as well as a maintenance program are included. Watch a video and learn more about our program HERE! 2018 CHEVROLET Cruze	$2499 Down! 2015 NISSAN Rogue	$2499 Down!